3 office transactions that Savills Korea concluded in Seoul were ranked within the 2018 APAC top 10 Property Sales Transactions according to RCA’s 2018 Asia Pacific Capital Trends report. 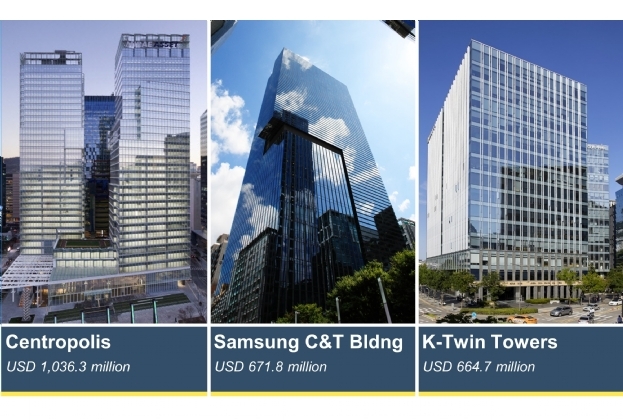 Within the report, Centropolis Towers ranked 4th with transaction volume of USD 1,036.3 million, Samsung C&T Bldng ranked 7th with transaction volume of USD 671.8 million and K-Twin Towers ranked 9th with transaction volume of USD 664.7 million. Hong Kong’s The Center ranked 1st with transaction volume of USD 5,122.1 million. In this report Seoul and Hong Kong both had 3 office deals ranked in top 10, Tokyo had 2, Taipei and Sydney each had 1. Crystal Lee, CEO, Savills Korea commented saying, “2018 Seoul Office market attracted a lot of oversea investors’ attention with abundant supply of trophy assets, and with domestics investors participating actively as well, prime office’s value per the unit square surpassed the KRW 30 million per 3.3sq m.” And to support this, according to Savills Korea’s 2018 Q4 Seoul Office Market Report, total investment volume in Seoul’s office market reached record high of KRW 11 trillion in 2018, with 12 deals worth over KRW 300 billion. According to RCA report, APAC’s 2018 transaction volume of income properties (including office, industrial, retail, hotel, etc.) was USD 159.1 billion. China recorded USD 31.3 billion, its lowest since 2014, as it reported its weakest economic growth since 1990 and the prospect of lengthy trade wars with the U.S. continued to impact the real estate sector, but kept its status as the largest country market in APAC in 2018. Volume dropped to USD 28.8 bilion in Japan, 26% less than the previous year, as Tokyo experienced the slowest activity since the Global Financial Crisis. South Korea, by contrast, reached an all-time high in 2018 with much of the story revolved around domestic institutional investors and increasing demand from cross-border buyers. South Korea followed China(31.3$b), Australia(28.8$b), Japan(28.8$b) and Hong Kong(25.7$b), recording USD 22.7 billion, which is 43% higher than the previous year. With extraordinary investment activity in the first half, Hong Kong remained the biggest city market in Asia Pacific in 2018 with annual investment volume totaling USD 25.7 billion – up 32% YOY. Investors spent USD 17 billion in Seoul, a 58% YOY increase, third largest in APAC metros following Hong Kong(25.7$b) and Tokyo(17.4$b). Demand came from domestic investors and also cross-border buyers headquartered in the U.S., U.K., Singapore and Canada.